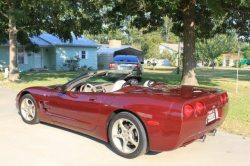 Home » C5 Corvettes » 50th Anniversary Convertible – LESS THAN 14,000 Miles!!! This ad has been favorited 21 time(s). 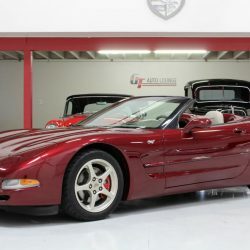 2003 Chevrolet Corvette 50th-Anniversary Special Edition Convertible!!! Very Nice Condition. We’re only the second owner!!! Hardly Driven, with LESS THAN 14, 000 Miles! 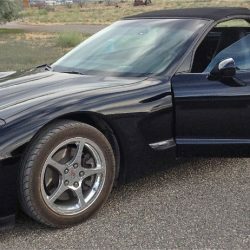 Non-Smoker, Older Adult Owned and Driven. 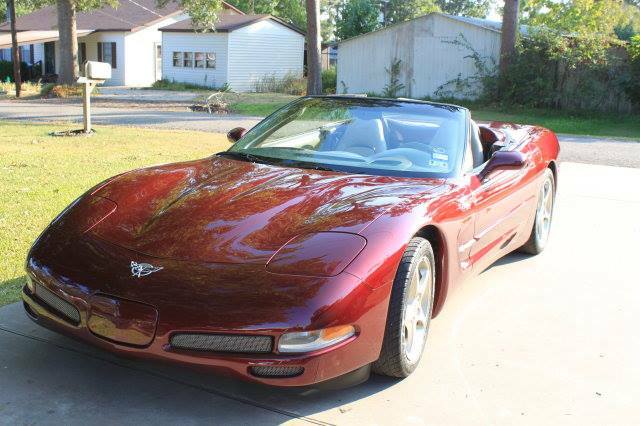 Clear-Clean-Texas-Title, Six-speed manual transmission!!! The 50th Anniversary Has a Special Designed Paint, made just for this One Year Only: Burgundy with Xirallic Aluminum-Oxide Flakes, Floating under a Special Tinted Clear-Coat. 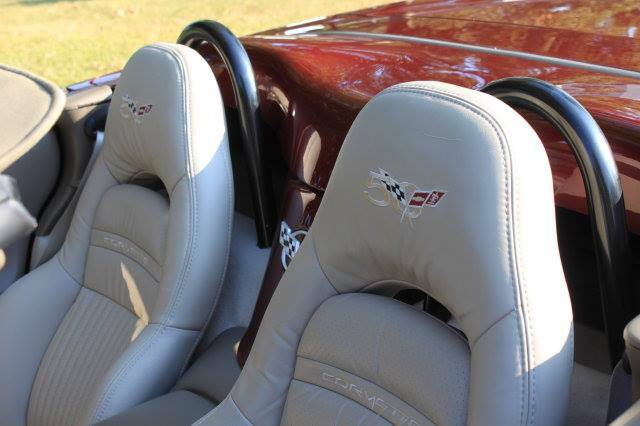 Unique, One Year-Only Shale Leather Interior with 50th anniversary Trim: exterior Anniversary Badges and Cockpit Seatback Embroidery. We’ve also recently added the special 50th anniversary floor mats and trunk panels. 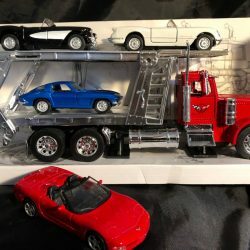 Complete Owner’s Manuals. 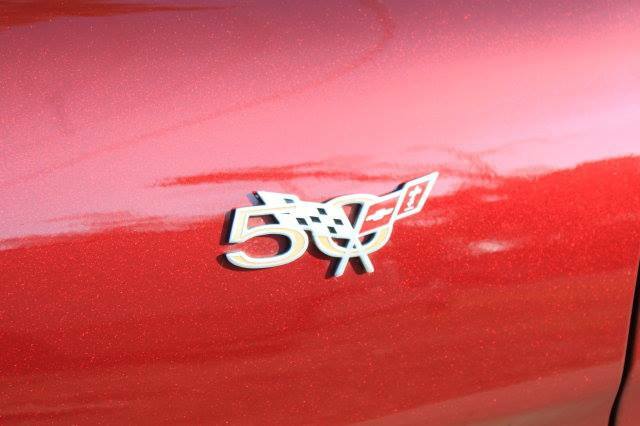 The 50th Anniversary also has a special designed Magnetic Selective Ride Control Suspension. The top is in great condition. RARE, dual roll bar option. After market exhaust installed when new (we have the original exhaust system if someone would want to but the original back on. Brand new tires, wipers and battery. 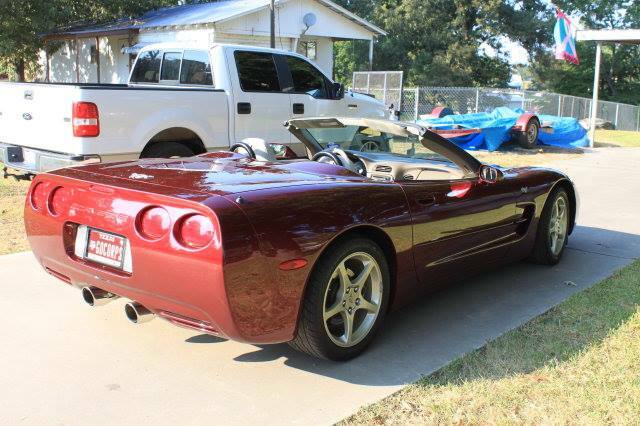 Includes the factory options available for the 2003 50th Anniversary Edition: Memory Package, Electrochromic Mirrors, Telescoping Steering Column, Twilight Sentinel, Heads-Up Display, Dual Power Seats, Factory CD Player with Bose Premium Sound System, etc. Includes a Limited-Edition Rear Exhaust Filler Plate with Cloisonne Anniversary Logo. Buyer is responsible for any tax, title, plate and title fee’s due in buyers state. 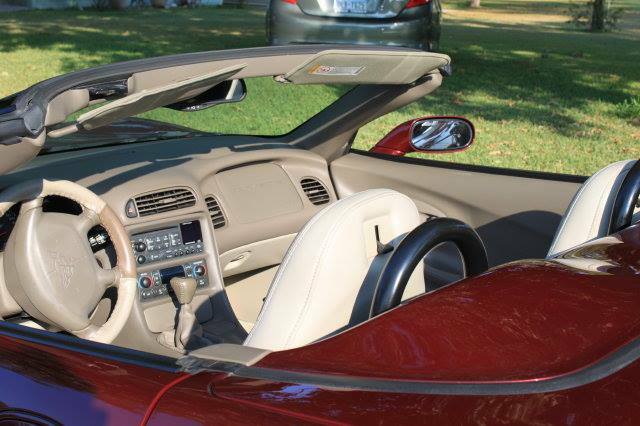 PLEASE… DO NOT CALL TRYING TO “HELP” ME SELL THIS CAR. Serious inquiries only. NO TRADES. CALL (9:00 am to 9:00 pm) or E-MAIL ONLY (trwiist@yahoo.com).